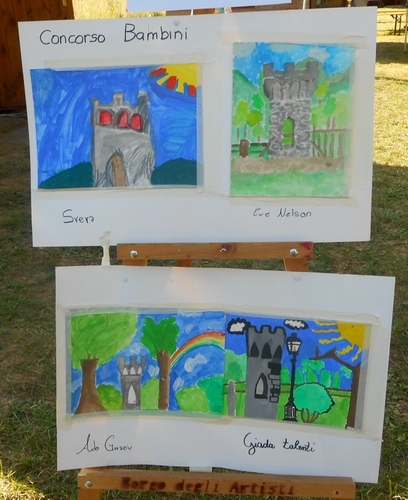 At the end of a sizzling day the judges convened to deliver their verdicts on the best paintings in Bagni di Lucca’s 9th extempore painting competition last Sunday. It’s not an easy task and, frankly, if the judges agreed among themselves, the spectators often had differing views. But this is the nature of art. Van Gogh never sold a painting in his life and who remembers much of the once popular Millais today? Artistic Creation is certainly not an exact science and for us the real winners were those who organised the competition, the goodly affluence of people present, the lovely weather and the sheer energy of those artists who’d take the trouble to come along to Bagni di Lucca, some of them for the very first time, and so spread news to the rest of the world of our lovely part of the world. There was real disagreement among us as to the winners, although each painting was seriously considered with an account of why it was chosen by the jury to receive a prize. The children competing all won first prize just for entering. I think, anyway, that a prize should be offered to everyone who had the boldness to enter – although, of course, the prize winners did get a cash prize amounting up to four hundred euros. Next year it’s going to be a very special year for the Extempore Art Competition. It’s its tenth anniversary. So all you budding Turners and Canalettos don’t forget to enrol! This entry was posted in Art, Arts Festival, Bagni di Lucca, Italy, Ponte a Serraglio, Tuscany by Francis. Bookmark the permalink. I think the judges had a very difficult job to do. I couldn’t pick a winner. I think it is a wonderful event. 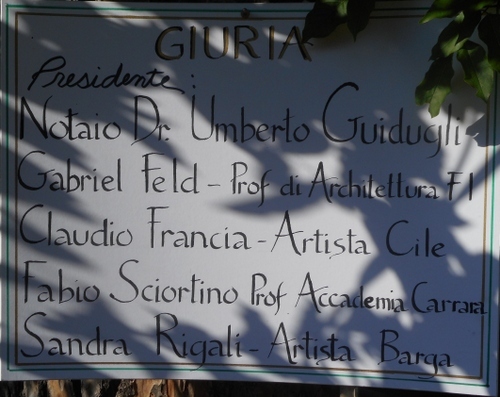 Top marks to Borgo degli Artisti.